A colorful past and a lively present characterize Joplin. Rich in history from our lead mining past, Joplin has grown to become the fourth largest metro area in Missouri. Joplin is full of friendly people eager to share their Ozark hospitality. At any time of the year there is activity in Joplin and in every direction surrounding it. Boasting an abundance of hotels and restaurants, Joplin truly serves as "Host to the Four States," whether you're here for a leisurely vacation, an art exhibit, a shopping spree, a convention or a historical tour. Four major lakes near Joplin are popular for swimming, speedboating, skiing, scuba diving, fishing and sailing. 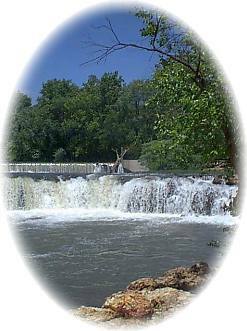 Joplin's Grand Falls are the only continuously running waterfalls in the state of Missouri. The city of Joplin is named after the Reverend Harris G. Joplin, who settled in the area from 1839 to 1844 and held church services in his home. With the discovery of lead, mining operations began in the early 1800s and were only interrupted when the Civil War began. In 1870, when a strike worth $64,000 was made, the Joplin Creek Valley emerged. From its humble beginnings, the community grew with the influx of businesses, railroads, utilities, hotels, theaters and parks. Joplin became incorporated in 1873. Discover the renaissance in the heart of the city. Historic buildings are being transformed into new roles as unique retail outlets, specialty restaurants and office space...offering many opportunities to visitors. Explore the changes first-hand on a special walking tour and experience Joplin's rich history. During the day, you'll find an eclectic selection of gift items, antiques and crafts, splendid clothing and fine salons. Get your kicks on Route 66 "and Jop-lin Miss-ouree" as Bobby Troop's 1946 hit goes, puts Joplin right in the middle of Route 66. Route 66 was commissioned on November 11, 1926 and was originally 2,438 miles from Chicago to Los Angeles. In the early 60s, another generation learned about Route 66 when Buzz and Todd spent 116 TV episodes traveling America in their Corvette. Founded in 1931, this museum boasts one of the world's most exceptional collections of lead and zinc ore dating back to Joplins mining days as well as a quality collection of mining tools and equipment. Spiva maintains a Regional Focus Gallery for the work of local and regional artists. Featured here are pottery by Jack and LeeAnn Sours of Golden City, Missouri.